McDonald's is making Happy Meals healthier. By 2022, cheeseburgers won't be part of the menu for the kids' meals, although parents can still ask for them. The main choices will be hamburgers and four- and six-piece Chicken McNuggets. And the French fry sizes will be smaller. All Happy Meals in the United States will have 600 calories or less by June, and at least half of stores and drive-throughs around the world will meet that target by 2022. McDonald's says the calorie count in an average Happy Meal will come down 20%. The company also said Thursday it will "reinforce responsible marketing to children," in a statement Thursday. The American Heart Association called the move an "important step in the right direction" and urged McDonald's competitors to follow suit. The organization said 40% of young children eat fast food every day. McDonald's (MCD) has been tinkering with Happy Meals for several years in response to pressure from public health groups, and to lawsuits for using toys to market to kids. Roughly 15% of McDonald's customers come in to order happy meals, according to Stifel analyst Chris O'Cull. McDonald's sells more food to kids and families than do competitors such as Burger King and Wendy's. In 2011, McDonald's added apple slices to Happy Meals. Soda came off the menu in 2013. And last year, McDonald's replaced Minute Maid apple juice with its lower-sugar Honest Kids brand juice. 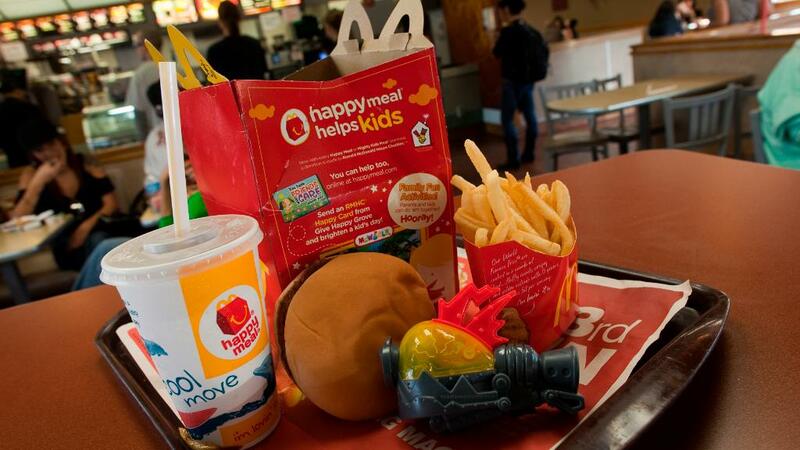 It's also experimenting around the globe with new Happy Meal items. Last month, McDonald's rolled out a grilled chicken sandwich in Italy, and locations in Australia and France are exploring vegetable and protein options. Ernest Baskin, a professor of food marketing at Saint Joseph's University, argued McDonald's made the changes for two main reasons: improving its image among parents and reducing costs on food. "Kids do crave McDonald's, but parents might not always feel good about bringing them there," he said. "By positioning their meals as healthier, McDonald's is likely attempting to make the decision easier for the parents."